Good things come to those who don’t wait. The BMW Pull-ahead Program Lets Current BMW Owners Take Advantage Of An Early Upgrade Into The Latest New BMW Models. The Pull-Ahead Program gives loyal BMW owners an exclusive opportunity and financial incentive to upgrade to the newest BMW models with the latest in technology, performance, comfort, and safety. Plus, you get the continued benefit of No Charge BMW Ultimate Service and full factory warranty for trouble-free ownership. The BMW Pull-Ahead benefits are one of the perks of BMW ownership. Don’t miss a payment (by making one). Take full advantage of the financial benefits available to you. $0	Pay no security deposit when getting into your new BMW. Cut to the front of the line. Really, it’s ok. We promise. 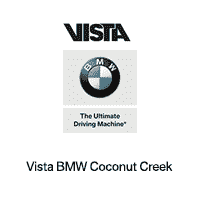 Please Complete The Form To Contact A Vista BMW Coconut Creek Client Advisor About BMW Pull-ahead Program Opportunities Available For You. Timing is everything. Schedule your BMW Pull-Ahead Program in advance to ensure all qualifying remaining payments are made by BMW. Give yourself enough time to review your options in advance. Please schedule your Pull-Ahead appointment today by contacting your Vista BMW Coconut Creek Client Advisor or completing the contact us form. *Excludes M Series, Alpina Models and i Series. The returning Lease or OwnersChoice customer must take delivery of a new or Certified Pre-owned BMW, and this vehicle must be leased or financed through BMW Financial Services. Only vehicles contracted between 24 and 60 months are eligible. Not all customers qualify. Please contact dealer for complete details.